Achieving your goals will depend on the hundreds, if not thousands, of people in your organization. While it has become a cliché to say that an organization’s most valuable resource is its people, the statement is true. The workplace is undergoing a significant transition that presents unchartered territory and tremendous opportunity. This transformation includes a workforce that now includes four generations. As you begin to address the people dimension of your job, you will be working in two distinct time frames: the near term, meaning your first six months or so, and the longer term. You have an important job to do and you need to get action quickly on the president’s agenda. While you and your immediate team will be talented and will work long hours, your immediate team will not be able to accomplish your goals by themselves. Your challenge will be to tap into the skills, talent, ideas, and strong work ethic of the career civil service. To succeed, you will need to rely on the career civil service to help you accomplish your goals. Do you have people with the right skills in place within your organization to get the job done? What do your organization’s annual employee surveys tell you about your organization? Are your employees engaged in their work? Is there trust and confidence between your employees and their supervisors? The answers provided to the first question should reflect the status of your organization’s workforce. You should probe to find out whether you have people with the right skills in the right job performing their assignments. If the answers are not to your satisfaction, there are many immediate steps you can take to remedy this situation. Your short-term discussions should provide you with a good understanding of your organization and the longer-term challenges the institution may now be facing. Your answers to the second question are something you can act upon immediately. Having your employees committed and engaged in the work of your organization is critical to your success as a leader. And creating that commitment and engagement is a key role of any good leader. Creating trust and confidence between employees and supervisors is also critical, but that may take time. Still, that will be an important investment of your time to ensure the work of your organization will be done effectively. After you complete your near-term assessment of the effectiveness of the people in your organization and their levels of commitment, you can then turn to more complex people issues that typically face every agency. These are crucial to the longer-term effectiveness of your organization and its ability to sustain the president’s agenda. Engaging a Multi-Generational Workforce. Today’s workplace is undergoing a significant transition that presents unchartered territory and tremendous opportunity. This transformation includes a workforce that now includes four generations. Over half of the workforce is currently unsatisfied with their jobs. These two challenges are compounded by rapid technology changes in the workplace. When taken together, this creates enormous challenges, as well as opportunities, for public managers today. Leaders need to build awareness that the Four Generations bring different ideas, challenges, and opportunities to the workplace. They need to rethink what work is, and where it is done and determine which jobs can have flexible arrangements, such as telework. Leaders need to use mentoring to develop new employees, and reverse mentoring to share tech skills. Managing workforce planning. Building on the plan you inherited will be one of your most important long-term initiatives in order for you to leave behind a strong institution. Given the anticipated retirement of many “baby boomers” during your tenure, you will have the unique opportunity to reshape the skill mix of your organization to better fit its mission and strategy for the next decade. Managing talent strategically. As an outgrowth of your workforce planning, you will need to develop and implement strategies to recruit, retain, develop, and manage your employees. Agencies currently have a number of hiring strategies under way including partnerships with universities, job fairs, and other outreach programs; the use of hiring flexibilities such as recruitment, retention, and relocation bonuses; re-employed annuitants; student hiring programs; and direct hire authority. You should aggressively use these hiring flexibilities. In addition to these hiring flexibilities, agencies have implemented learning and leadership development programs such as the Candidate Development Program, emerging-leaders programs, and other succession planning initiatives. Agencies have also implemented other programs to retain employees including child care, student loan repayments, telework, and other work life initiatives. Your chief human capital officer will be able to brief you on current strategies, as well as how well these strategies are working. Managing for better performance. Your agency should have a performance management system that is designed to link employee performance plans with the agency strategic plan. As a result, employees should have performance plan goals that align with and support the organizational goals. Similarly, employee ratings should be linked to the overall performance of the agency. Some agencies have legislation that authorizes a pay-for-performance system, perhaps including paybanding. A pay-for-performance system could serve as an effective complement to your initiatives to drive performance and accountability. You will need to decide whether the nature of the work of your organization lends itself to pay for performance including paybanding. If you do decide that your agency needs pay for performance or paybanding to improve performance, then you will need to work with the Office of Personnel Management (OPM) and the Office of Management and Budget (OMB) to seek legislation. Managing a changing workplace environment. Given rapid technological changes, the advance of mobile technology, and the overall changing nature of work, the traditional workplace and environment has become one of many possible options, and one that continues to be receding in favor of more non-traditional flexible workplace arrangements. You need to explore and align the most effective workplace arrangement that enables you and your staff to meet mission. Flexible work arrangements, such as telework or a compressed work week, are options to consider that can increase staff morale, reduce costs, and enhance your agency’s overall effectiveness. To accomplish your goals, you will need to create an effective working relationship with a variety of different groups, including individuals inside and outside your own organization. Within your own organization, it is crucial that you develop a good working relationship with your own employees. An important group of your employees is union members. Your chief human capital officer (CHCO) should be able to tell you how many unions and union members are in your organization, as well as the extent of their influence and the “state” of labor relations in your organization. Based on the experience of many previous agency heads in government, spending an appropriate amount of time with your union representatives to forge an effective working relationship can be beneficial. You will also need to work closely with key government staff outside of your own organization. Specifically, you will have to work closely with two central management agencies: OPM and OMB. Both are intimately involved in a variety of people issues, such as pay, employment ceilings, and the number of Senior Executive Service “slots” within your organization. Hannam and Yordi observe that the U.S. workplace is “undergoing a significant transition that presents unchartered territory and tremendous opportunity.” This transformation includes a workforce that now includes four generations. They also report that over half of the workforce is currently unsatisfied with their jobs. These two challenges are compounded by rapid technology changes in the workplace. When taken together, this creates enormous challenges, as well as opportunities, for managers today in both the public and private sectors. This report examines six trends now occurring in the workplace and describes how managers can successfully engage all four generations and “commit” to the organization. For example, each of the four generations has different learning and communication styles, different work-life balance needs, and different preferences in how their contributions should be recognized. Understanding these differences and preferences can lead to a more effective organization. This report offers practical implementation advice to agency leaders and front-line managers faced with implementing the newly-enacted law expanding telework opportunities to over one million federal workers. Telework has been touted as being a winning strategy for government. A study by the Telework Research Network claims potential savings for the federal government of nearly $3.8 billion as a result of reduced real estate costs, electricity savings, reduced absenteeism, and reduced employee turnover. Dr. Overmeyer describes the technological, social, operational, and management risks that face managers in implementing a telework strategy. He then shows how four cutting-edge federal agencies have addressed these issues and have successfully implemented a telework initiative. Understanding the practical challenges, and steps some agencies have already taken in piloting this approach, will be important as government leaders face the six-month implementation timeframe required under the recently signed legislation. Listen to Dr. Overmeyer's interview on Federal News Radio. Today the country faces challenges of unprecedented complexity, from guiding an economy through crisis to expanding healthcare coverage. To meet these and a myriad of other challenges will require transforming the way government works while also inspiring the best and brightest to choose public service. Building, energizing, and maintaining a high-quality workforce is the key to success for any organization and the federal government is no exception. How does the Partnership for Public Service seek to inspire a new generation to serve? What is the Partnership for Public Service doing to transform the way government works? And what are some of the key human capital and workforce challenges facing the federal government? I explored these questions and so much more with our very special guest Max Stier, president and CEO of the Partnership for Public Service. “If you give your employees the chance to learn and grow, they’ll thrive – and so will your organization,” says Gretchen Spreitzer and Christine Porath in an article they wrote in the January-February 2012 issue of Harvard Business Review. Their article doesn’t focus on creating happy employees but rather “thriving” employees. They say the focus should not be on creating contentment but engagement. After all, “contentment” connotes a degree of complacency, note the authors of the article. We believe government leaders and managers should incorporate these seven imperatives into their management practices to execute their organization’s mission successfully. 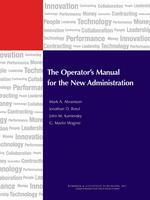 Read our other Operator's Manual Blog, an update of Chapter Two: Performance. Read our update of Chapter Eight: Collaboration.